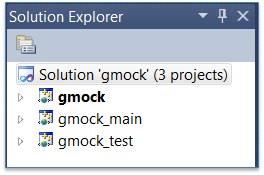 Following on from my last post about setting up googletest to use with Visual Studio 2010 express edition, this post builds on that by showing how to build, setup and test the googlemock libraries. If you have read the previous post, then the basic steps are very similar. First, download the googlemock zip file and unzip it to known location. As before, I suggest something easy, either C:\gmock-1.6.0, or as in my case C:\src\gmock-1.6.0. One useful fact is that all the gtest code is included as part of the gmock distribution. It can be found at \gmock-1.6.0\gtest. The gmock libraries contain all the gtest code as well. Navigate to the directory \gmock-1.6.0\msvc\2010 and open the Visual C++ project gmock (gmock.sln). You will end up with three projects. As part of the standard build two executable are created that allow a quick self-test of googlemock (gtest does have the same but I neglected to mention those in my previous post). This indicates that (most of) gmock functions correctly. and exclude file containing default main from build. An interface class that the UUT calls upon, which doesn’t have any implementation (or the implementation is target/hardware specific). Set the mock objects expectation [line 20]. The mock expectation is that the Off member function will be called twice, once during WidgetController construction and once during destruction. Once you have a working project, the documentation on the Googlemock site is excellent. Start with Googlemock for Dummies. 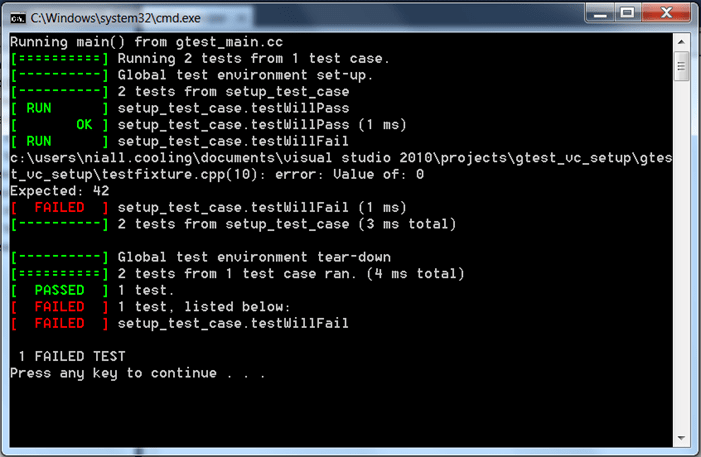 This entry was posted in C/C++ Programming, Testing and tagged C++, googletest googlemock msvc TDD. Bookmark the permalink. Oof. I've been thinking about moving (part of) our group to a dual-target, test-as-you-go kinda system rather than our current ad-hoc style. I'm a little worried about the first couple times we try it because I know setting up the dual-target environment is going to be time consuming, but I'm sick of finding missed corner cases 3 months into hardware integration where they start pushing the schedule out. Thanks for the link to the Grenning book, the excerpts look like they have some good advice to get me started. 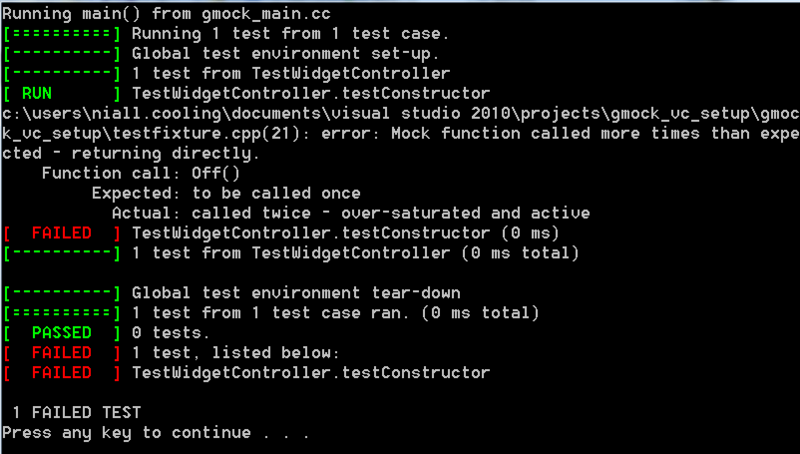 there was an outdated GTestDir definition in gmock_config.props, a change from "../../gtest" to "../../../googletest" did it. At least the libs were compiled, i still got the gmock_test error though.